Quite a stressful game, this; creating new ‘normal’ rooms in the main body of the church-wot-we-bought. Both of the nice pleasant windowed ‘side’ rooms have had existing doorways blocked off. Smaller No 2 dem room, was going to have an exterior door left intact until we saw how hideous it would look. We got creative with timber frame, 18mm MDF and some of the wooden wall facings and were rather chuffed with how its all looked. 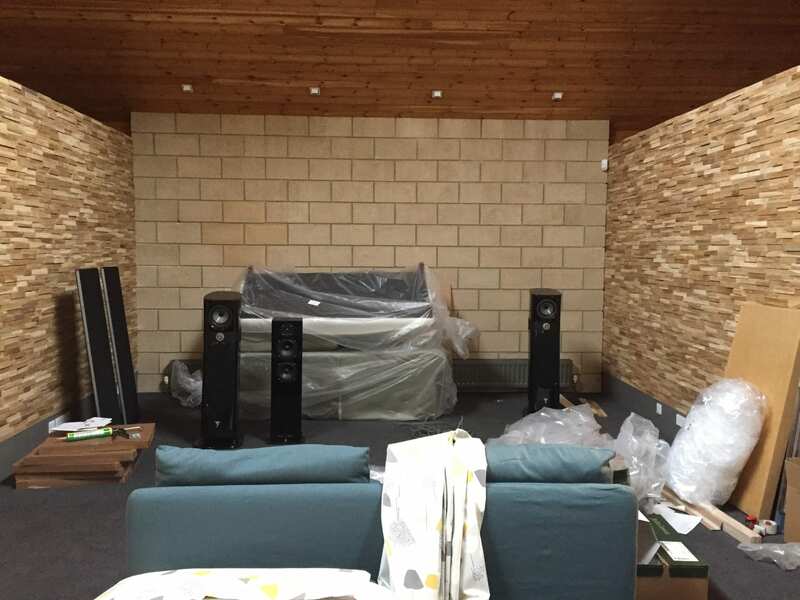 Even better, when we tried a Linn Majik DSM on Tidal and a pair of MG 0.7 speakers, we were genuinely astonished at the results. Other speakers from PMC and Kudos sounded superb too. Result! 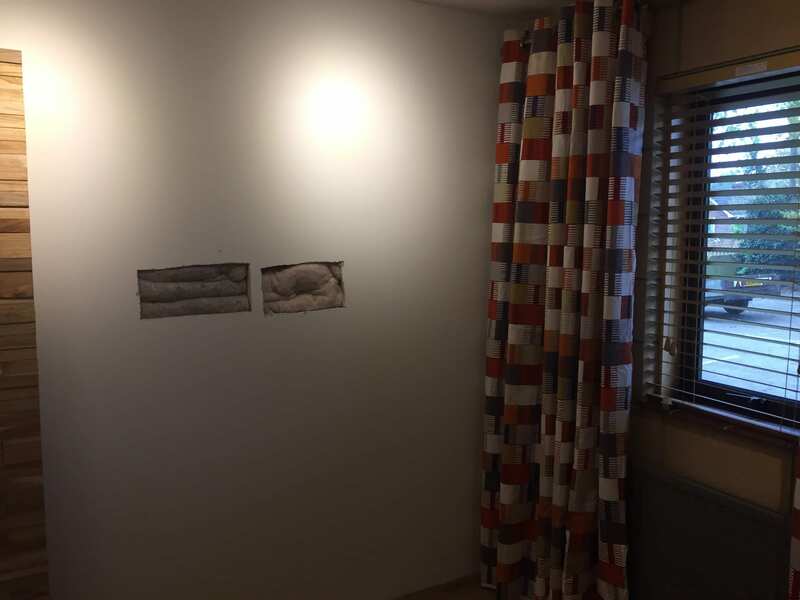 We had been keen to keep as much as possible of the original structure but the larger room, let’s call it room 1, had quite a lot of damage to the concrete / stone blocks that became evident after a radiator was removed. The decision by muggins was to simply ‘lose the wall’ behind some dot & dab plasterboard. All prior discussions of how to disguise the doorway had involved requirements to properly insulate and deaden the cover. Sadly, the final instruction made the assumption that this would carry over. With a nice solid framework, but no damping, I kind of knew it was not ideal but I didn’t expect quite what we got. Playing a system in there was the wrong kind of revelation and an upper bass ‘thrum’ could be traced easily to the plasterboard in front of the doorway, presumably with the empty space behind adding voice. A quick attack with a pad saw by Andy confirmed the emptiness within. A plan was hatched to deaden the void and apply a thick MDF cover over the whole end wall faced with our beloved random timber blocks. An emergency run to B&Q last night was followed by yours truly making an early start today. I’ve just managed to squeeze three and a half bags of recycled plastic insulation into the void. Just hope that the plasterboard doesn’t ping off! Curious discovery this morning is that the smaller room is virtually devoid of ‘flutter’ echo whilst the larger one has considerably more. 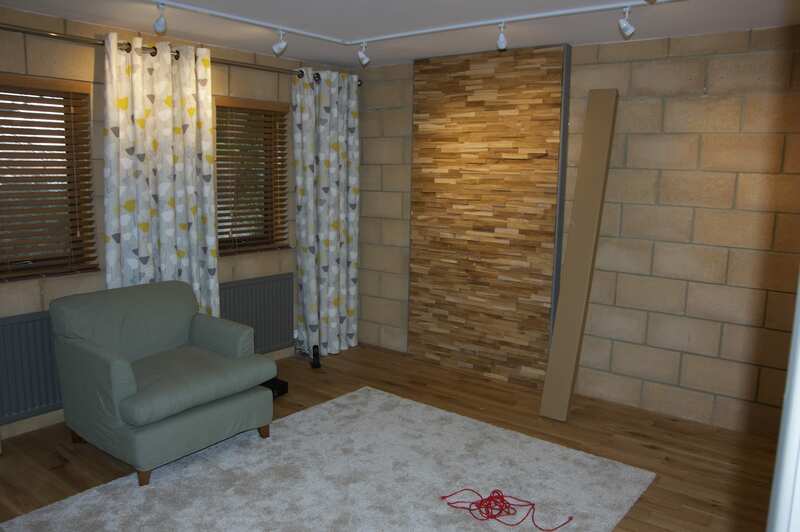 The only physical differences are about 1.5 m of length and that bloody plastered wall. The rest of the building is a bit messy too at the moment. A change of heart over the sofas to be used means that we have some extra clutter. The Focal Sopra 2s look rather small in there. Naim Stement will slip in very unobtrusively! In truth, I think we will struggle to get the large central space fully damped in time for the opening day. We really need to play with options, and that takes time.